Lemon Poppy Seed Dressing is the perfect way to add a sweet and tangy punch with a little crunch to your salads! Why buy store-bought when you can make this easy and delicious homemade dressing? All you need is olive oil, lemon juice, honey, and poppy seeds, and salt and pepper! Last week, I made Chicken Cutlets with Strawberry Salsa. The next day, I decided that I wanted to turn the leftovers into a salad. A salad similar to my favorite Panera’s Chicken and Poppy Seed Salad. I figured that I could just add some lettuce leaves, dice the chicken and add the strawberry salsa for a good base. I had blueberries in the fridge so those would go in. All I needed was a dressing. The dressing on the Panera’s salad is a poppy seed dressing, so I whipped up this Lemon Poppy Seed Dressing. Then for even more sweetness and crunch, I added Bourbon Candied Pecans. Because….why not! 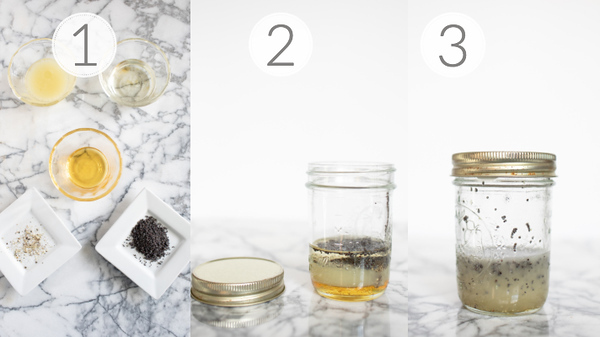 Can we talk about how easy it is to make your own salad dressing? It takes maybe 5 minutes and tastes so fresh. Best of all you know all the ingredients and it’s not filled with ingredients with long chemical names and preservatives. Step 1 – Gather your ingredients: olive oil (use a good quality extra virgin olive oil or a neutral oil,) fresh squeezed lemon juice, honey, poppy seeds, and salt and pepper. Step 2 – either place all the ingredients in a jar or in a bowl. I prefer a jar because shaking it mixes everything together so well and if you have any leftovers you can easily store it in the refrigerator. Step 3 – shake or whisk the ingredients until well combined. I thought I’d show you a picture of my finished salad! it was every bit as good as it looks! 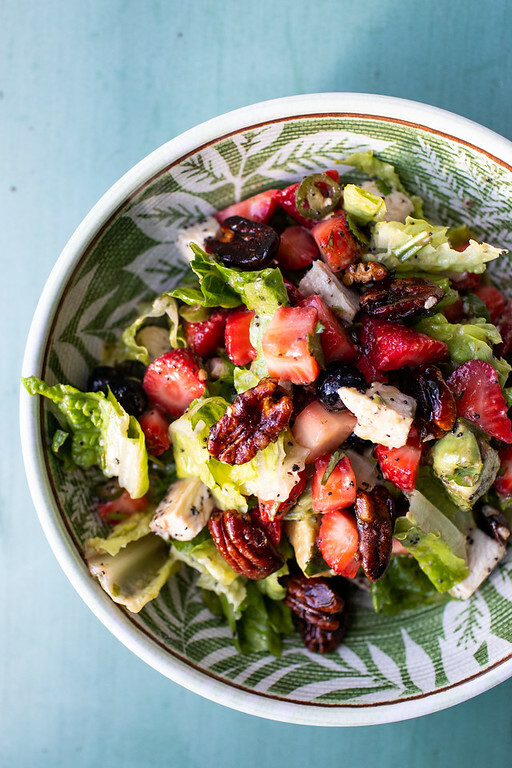 The poppy seed salad dressing went perfect with the fruity chicken salad. I’m sure I don’t have to tell you how amazing the Bourbon Candied Pecans were to top it off! 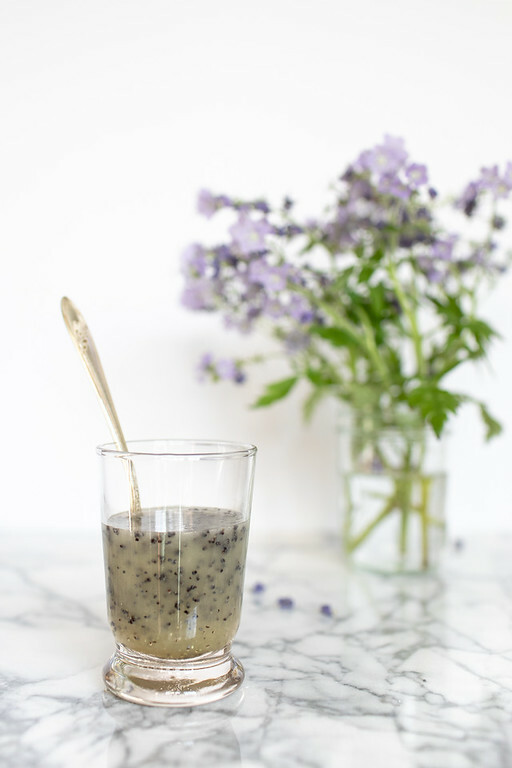 I will be using this homemade poppy seed dressing a lot, because it goes so well on salads that have fruit and almost all of my salads have some sort of fruit in them, even if it’s only dried cranberries. Be sure and follow my Salad Dressings Board on Pinterest for even more yummy salad dressing recipes! 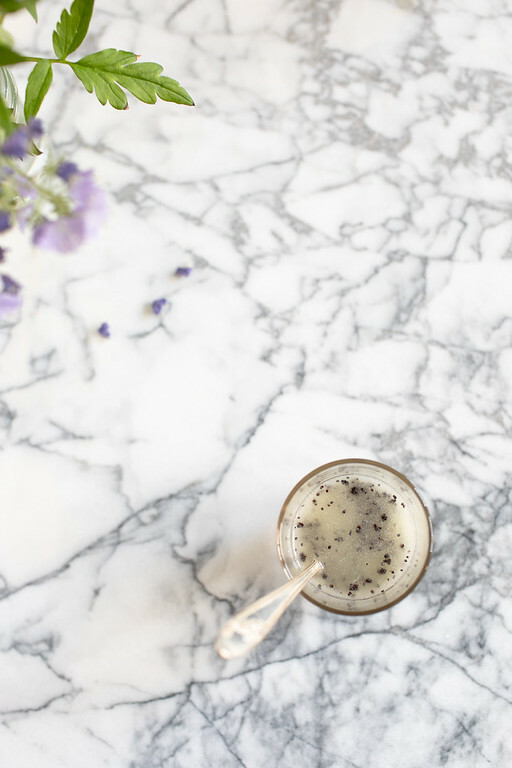 No need to buy store-bought dressing when you can whip up this delicious sweet and tangy poppy seed dressing. Put all the ingredients in a small jar (or a small bowl) - either whisk until combined or put a lid on the jar and shake until combined. Lemon Juice - always use fresh squeezed lemon juice. Oil - can use olive oil or any other neutral oil. This dressing will keep for 2 weeks refrigerated - just shake or whisk again to combine. This is perfect! I have a container of poppy seeds that I need seem to know what to do with. I could put this dressing on everything! It looks so fresh and delicious! Love that little touch of honey in this salad dressing! Poppyseed dressing is one of my favorites for that hint of sweetness. I love that hint of sweetness too! Yum, what an easy and tasty dressing! I love poppy seeds. Even though they’re great all year round they always remind me of spring. So good! Thanks for the recipe! They remind me of spring too! I love to make my own dressings but sometimes I am lacking the ingredients or it is just convenient to take a prepared dressing. I should definitely make this poppy seed. You should! And, let me know what you think!